Order your Mini-Shredder ready to shred right out of the box. 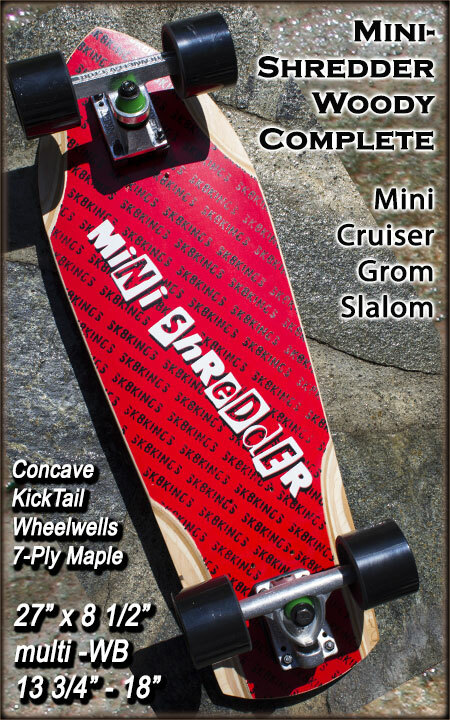 Fully loaded with select quality components -- the Mini-Shredder Complete is the solution to your mini-cruising or grom slalom needs! Featuring concave, kicktail, multiple-wheelbases, fully routered wheelwells, tail skid plate option -- this killer little shredder is just 27" long with a comfortable 8 1/2" width -- the perfect go anywhere fun ride! Great beginner slalom setup for mini-racers and 100% So Cal Made. Overall dimensions: 27" x 8 1/2"
Dual wheelbase: 13 3/4, 15 1/4, 18"
CUSTOM BUILT FOR YOU: Specify rider weight when ordering AND what the set-up will be used for so we can use the correct wheelbase and dial all components accordingly. OPTIONAL UPGRADES: Trucks: Choose from list available to further customize your complete. Wheels: Choose from the list at checkout to upgrade wheels & make special durometer requests in the "NOTES" section if needed. Premium Bushings: Upgrade to Reflex or Venom all around. Bearing Upgrade: Choose Upgrade to Oust, Builtin, etc. bearings. Oust Bearing Maintenance Bundle: Includes one bottle of Oust Metol Speed Lube and one Oust Speed Kleen Bearing Wash Kit at a special bundle price savings. Remove harmful dirt and buildup from bearings with the Kleen Kit and relube with Metol Speed lube. Choose upgrades when ordering -- additional charges apply. Custom Stripe Grip Top --available. Choose from Glow in the Dark stripe or Red & Black stripe when ordering.